I’ll start by saying that there will be no recipe in this post. I know this is a recipe blog but this post sort of a pre-recipe post. 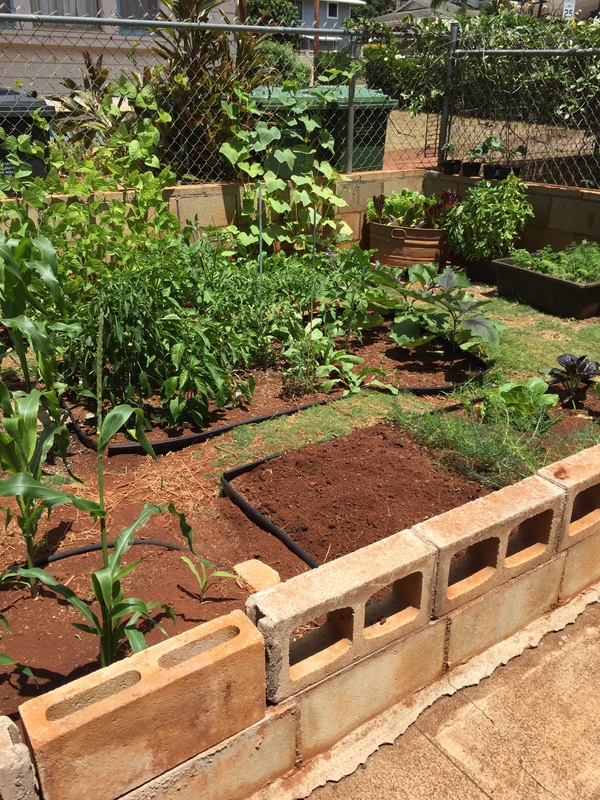 It is a post about the garden I recently planted that in which I am growing many of my ingredients in my upcoming recipes. Think of this post as a hint at yummy things to come! Week 4 – Everything is so big now! Last month, the roomies and I decide that it was time to finally make the garden we had all been talking about essentially since we moved in a reality. It all started with talk of a few cute little sunflowers along the fence to block our neighbor’s very loud, and ugly, pickup truck. Nothing more, just some flowers. That, of course, didn’t last long. Very quickly, we realized that it didn’t make sense just to plant sunflowers, we should also plant some corn. Those go together, right? Sunflowers and corn then grew to sunflowers, and corn, and tomatoes….and once we got to that point, there was no shortage of things we wanted to grow. Then, as with many of the best laid plans, our ambitions flagged for a few months. No one actually wanted to dig up the grass and make the garden beds. That is a heck of a lot of work! Finally, last month, we got up the strength and excitement needed to do the digging and fertilizing and planting and waiting and watering and weeding and all the other things required for suburban gardening. The garden is now a month old and growing strong. It is huge! (I will admit to buying some seedlings to speed up the process but the majority of the plants we did grow from seed.) We are already eating all sorts of greens, cucumbers, radishes, and peppers with tomatoes and green beans on the way in only a few more weeks! After that, eggplants and snow peas will be ready. In a few months, corn and beets. So many great vegetables just waiting to be munched upon. It is clear that this experiment is working out very well. We don’t have much space and our soil and light aren’t the best but we are able to produce enough veggies to dramatically reduce the amount we buy at the store. Proof that even a small space can make a huge difference! I recommend everyone has at least a pot of flowers or herbs growing. It is amazing how good it feels to eat vegetables you grew yourself. Growing up, my family always had a very large garden for summer vegetables and for winter preserves. I loved helping my mom in the garden…okay, I loved sitting there eating the vegetables and watching her work. I was a bratty kid, what can I say? Since I left home for college, I have always had small container gardens but this is the first time I have had an actual garden planted in the ground since then. It feels great! 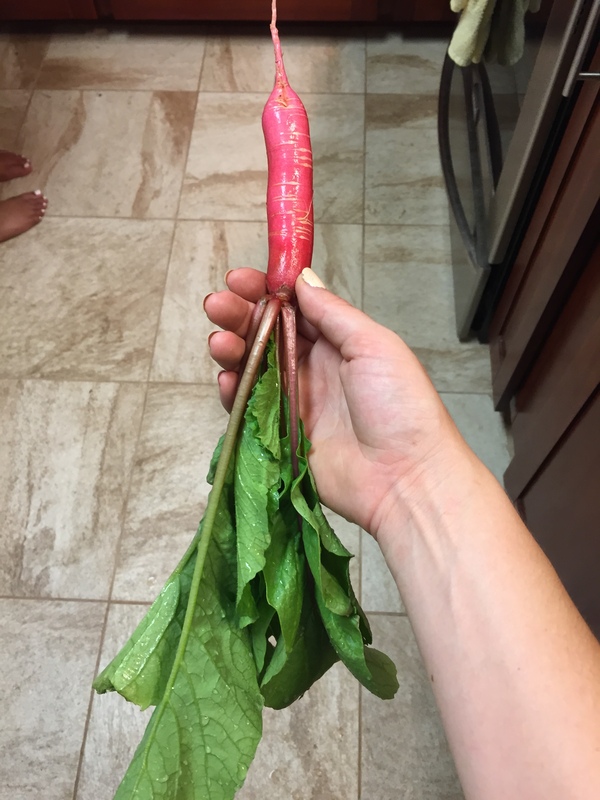 I love going outside and picking vegetables for dinner or just going out there for a quick snack. Not only do we have all sorts of vegetables, herbs, and greens, the yard is coming alive! There are bees and lizards everywhere! 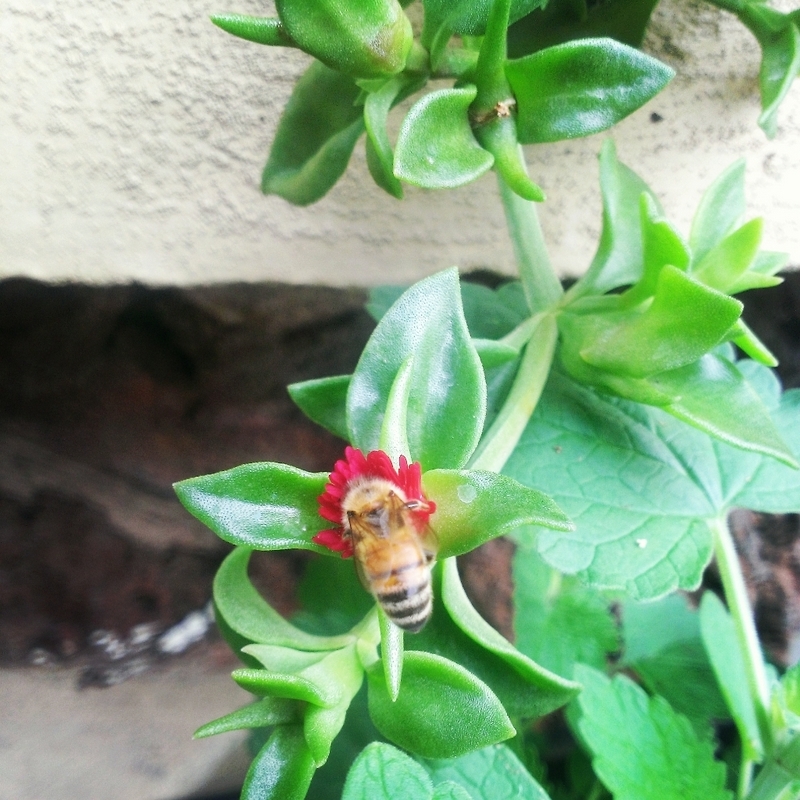 I planted flowering herbs to attract bees for the garden and now the lizards are coming to eat all the bugs. Small changes are making a huge difference. When we moved here, there were almost no lizards or bees. Since we have been taking care of the trees and bushes, they are flowering and producing fruit. We have too many guavas! The egg fruit tree has hundreds of buds. Hopefully, this summer will be filled with fruits and veggies straight from the yard. Happy gardening….and, of course, eating! Growing pineapples at home is easy. Just twist off the crown and place it in a glass of water until roots grow then plant in a pot. It looked so good at the time…little did we know just how fast it would grow! These pepper plants are getting tall! Week 2 – everything came up! Ah, such a beautiful garden with all those tropical plants! I am waiting and waiting for our Spring. Enjoy your garden and all its bounty! Molly! What a BEAUTIFUL creation you have made! How wonderful and inspirational and healthy too. Congrats to you ‘Molly the Chef’ and to your roomies!!! Enjoy the fruits of your labor! Egg fruit has the texture of a dry sweet potato and kind of tastes like one with brown sugar. They are very tasty! I would send if I could but we have really strict agricultural laws that keep us from sending much fruit around…though I do try to smuggle some to my mother on the mainland sometimes. It doesn’t always work. Hahaha. I haven’t made guava jam yet. I make a lot of others but haven’t tried that yet. Do you have a good recipe for it? I would love to try it if you do. Beautiful! We miss living in a sub-tropical area, but there are things we can grow here that do not grow there, so we just make the most of our ice and snow! lol. Thanks for following my blog, cheers, Suz. It’s true. There are trade offs between the warmer and the more traditionally seasonal climates. I miss a lot of the colder weather produce but I can’t really complain when I get mangos and guava in their place. Everywhere has it’s own magic. 😊 The key is realizing what makes your own slice of the world perfect for you at that moment! Have a great evening.